Durable and eco-friendly, our Poly Serving Bar will stand in as your drink station, buffet table, and a place to get together for a casual meal. Crafted from recycled milk jugs, poly lumber offers an environmentally friendly alternative to traditional plastic, wood, or metal pieces. Requiring very little maintenance, our poly furniture is made to last decades and will not fade out from sun exposure, or crack, splinter, and chip like traditional pieces. You can also cancel out rust, mildew, and termites from potential hazards. 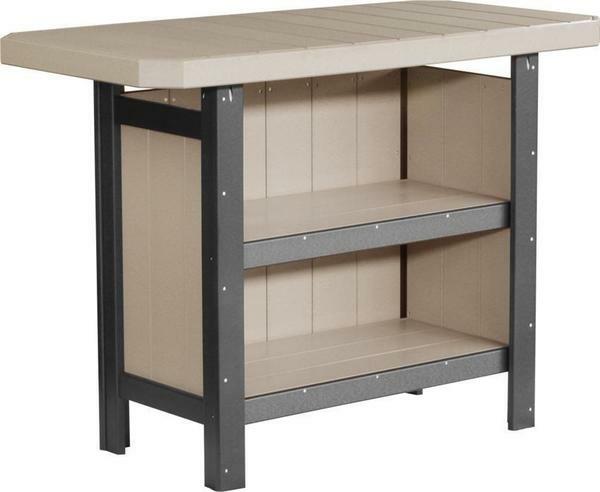 The quaint design of our poly serving bar offers a large top (58" x 30") - giving you a place to house anything you need to enjoy a day outdoors. Below, two shelves offer up plenty of space to house your drinks, glasses, and other bar necessities, for easy access and storage. Choose from a wide array of vibrant colors and get the bar to match your unique decor. Don't forget the matching poly bar stools to complete your set.